Blood flukes from the genus Schistosoma are found in over 77 countries, infecting at least 230 million people, and second only to malaria as the most socioeconomically crippling parasitic disease in the world. But the majority of flukes from the family Schistosomatidae do not infect humans; they parasitise other species of mammals, as well as birds. There are about 100 known species of schistosome flukes around the world. Understandably, those species from the genus Schistosoma are the most extensively studied due to their public health importance. However, there are many other blood flukes for which very little is known on even the most basic aspect of their ecology. 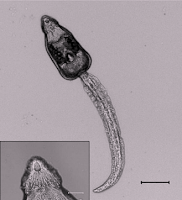 Meet Bivitellobilharzia loxodontae; a schistosome that parasitises African forest elephants (Loxodonta cyclotis). 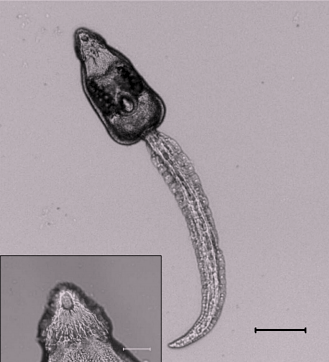 It holds the distinction of probably being the most poorly known of all the schistosomes. The first and only adult specimens of this fluke were retrieved from an elephant that had died in an animal park in Hagenbeck, Germany. To this day, almost everything known about this parasite had come from those samples which were described in 1940. 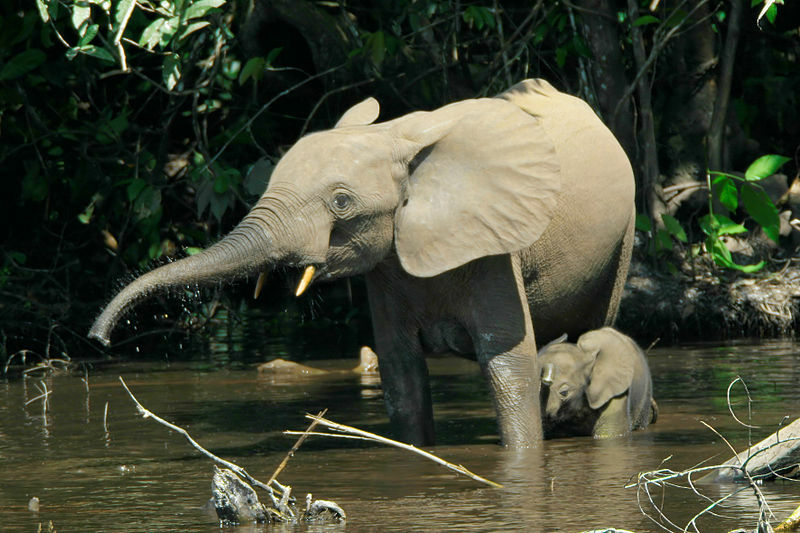 The elephant that was hosting those blood flukes was likely captured from the region now known as the Democratic Republic of Congo. Because B. loxodontae is an endoparasite (internal parasite) of elephants, adult specimens are hard to come by as they can only be retrieved via "destructive sampling" (dissecting the circulatory system of a dead elephant). And despite extensive sampling in the area where the forest elephant resides, the snail host (where the asexual larval stages of this parasite reside) has not yet been identified. Documenting the life-cycle of these parasites is a labour-intensive and time-consuming task as it requires finding all the different larval stages and demonstrating that all those different stage do indeed belong to the same species by performing experimental infections. Performing experimental infection on an animal like an elephant is out of the question due to its large size and rarity. With the advent of molecular techniques, it is now possible to confirm the identity of parasites at different stages of their life cycle without experimental infection (even though experimental infections are still useful for working out other aspects of a parasite's ecology). This can be done by sequencing specific sections of DNA which can serve as markers that identify the species and differentiate it from other parasites which might look similar. In the paper we are featuring today, the researchers extracted DNA from B. loxodontae eggs that were retrieved from samples of elephant dung in order to work out how this blood fluke fits into the schistosome family tree. Their analyses showed that out of all the schistosome blood flukes, it is most closely related to Bivitellobilharzia nairi - a species known from the Asian elephant (Elephas maximus). Taxonomically, the genus Bivitellobilharzia sits near the base of a branch within the schistosome family that contains mammal-infecting species (including those species from the Schistosoma genus). The pattern of branches in the schistosome family indicates that at some point in the past, the mammal-infecting group evolved in a divergent direction (in terms of host use) to the rest of the family, which is composed of species that infect birds. This raises intriguing questions about the deep evolutionary history of this group of parasites. Brant SV, Pomajbíková K, Modry D, Petrželková KJ, Todd A, Loker ES. (2013) Molecular phylogenetics of the elephant schistosome Bivitellobilharzia loxodontae (Trematoda: Schistosomatidae) from the Central African Republic. Journal of Helminthology 87: 102-107. Aquaculture is one of the fastest growing food production industries in the world; it is already responsible for supplying half of fish consumed by the world's population and will soon account for the majority of fish on people's dinner plates. But like other forms of animal production, outbreak of infectious diseases in aquaculture can result in massive die-offs (such as the recent virus outbreak at oyster farms near Sydney, Australia). But even at lower levels of infection prevalence, having infected and sickly animals can result in a loss of production due to reduction in growth and/or the diseased animals simply become unmarketable. Fish can be infected by all kind of parasites and pathogens ranging from microparasites such as viruses and bacteria, to macroparasites such as flukes, worms, and fish lice (which are actually crustaceans). The parasite we are looking at today - the fluke Drepanocephalus spathans - was found at a fish farm rearing channel catfish. 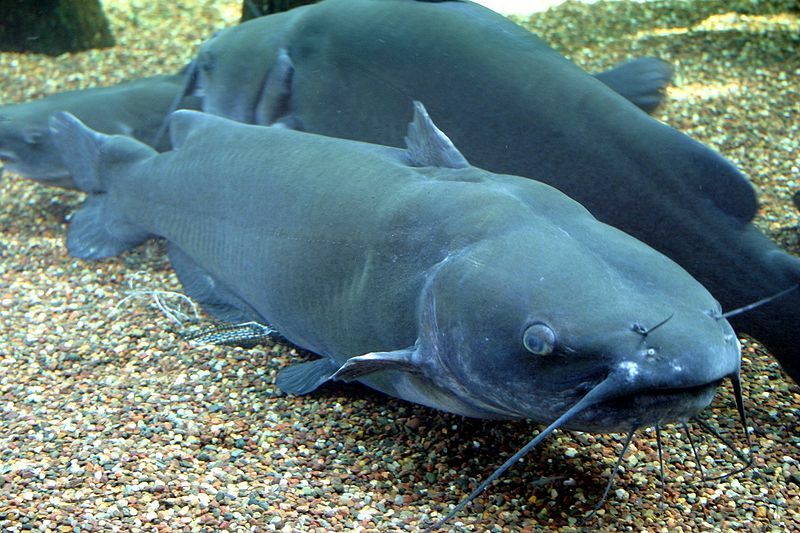 Channel catfish is a very popular angling species in the United States and it has also become a very popular commercial aquaculture species over the last few decades. Incidentally, catfish farms also make ideal habitats for the rams-horn snail (Planorbella trivolvis) and they are commonly found at fish farms. These snails also happens to be host to a variety of trematode flukes, some of which happen to infect fish as the next host in their life-cycle. In the study we are looking at today, a group of researchers at Mississipi State University examined rams-horn snails from a catfish farm and found the snails there were shedding at least four different species of trematode flukes, with D. spathans being the most abundant species. Drepanocephalus spathans has a typical fluke life-cycle with three hosts - in this case snails, fish, then fish-eating birds. 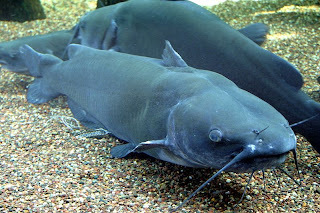 The researchers had known from an earlier study that some of the ram-horn snails at the site did shed larval stages (cercariae) of D. spathans, but the parasite was not previous thought to cause affect the health of the catfish. But when they conducted experimental infections where they placed some catfish in tanks with cercariae-shedding snails, some of the fish died within a week of being exposed to infected snails. When they dissected the surviving catfish (which showed no external signs of disease), they found that the parasites form cysts that congregated mainly around the head of the catfish, particularly at the base of the gills arches. Their presence can possibly interfere with oxygen uptake and had been the cause of death for the fish that had died from exposure to the parasite. Other animals that frequent catfish farms are fish-eating birds, and ram-horn snails become infected by D. spathans from the parasite's eggs which are shed in the faeces of such birds carrying the adult fluke - in this case the Double-crested cormorant (Phalacrocorax auritus). The parasite undergoes asexual proliferation inside the snail to produce the larval stages that then go on to infect the catfish. So the cormorant is a key source of the parasite; but it is also a protected species under the Migratory Bird Treaty Act, so getting rid of birds "terminally" was not really an option. They also usually feed at night when no one would be around to try and scare them off. Therefore, the key to breaking the life-cycle of this parasite lies with finding a way of controlling the population of snails at the farm. Flukes with similar life-cycles are common to fish farms and also cause fish diseases in other parts of the world such as Taiwan, Vietnam, and Finland, therefore this is not a problem that is restricted to the fish farms of United States. Understanding the life-cycle of the parasites and how they use each of their hosts is an important step in figuring out how to control disease outbreaks - whether in aquaculture or other contexts where infectious disease is a major problem. Griffin MJ, Khoo LH, Quiniou SM, O'Hear MM, Pote LM, Greenway TE, Wise DJ. (2012) Genetic sequence data identifies the cercaria of Drepanocephalus spathans (Digenea: Echinostomatidae), a parasite of the double-crested cormorant (Phalacrocorax auritus), with notes on its pathology in juvenile channel catfish (Ictalurus punctatus). Journal of Parasitology 98: 967-972. P.S. Speaking of aquaculture, I have a new paper on the global pattern of disease outbreak in aquaculture in Journal of Applied Ecology. It has been selected as the Editor's Choice; you can read a summary of the findings and a link to a free copy of the paper here.